Is This the Story of How the Meek Mill vs Drake Beef Started? 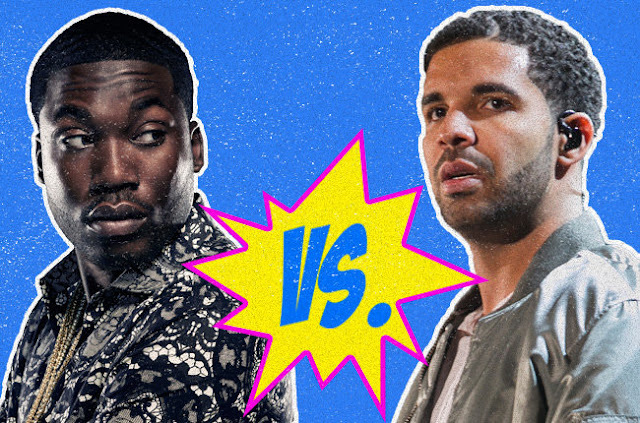 Twitter has been going crazy over the past 10 days about the Meek Mill vs Drake beef. It has given us two solid diss tracks and other hit songs from Drake, and several tweets and one minuscule song from Meek Mill. With all of this said (especially after OVO Fest on Monday night), Drake is winning this beef. But what caused this beef to start in the first place? Was it because Drake didn't tweet his album? Was it his alleged ghostwriting? Did he sleep with Nicki Minaj? Is it just jealousy from Meek? This is the real tea that i found out from someone close to dj dramas girl. 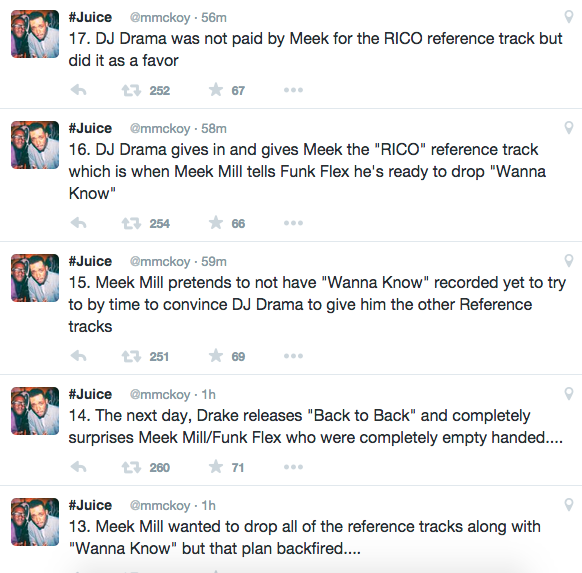 Meek found out from dj drama that drake had used a reference track from quinton for RICO. Meek confronted drake about it and they had a lil argument and drake felt like he was disrespected for the way meek came at him since he was doing a favor for meek. This happened the same week of meeks homecoming concert. Drake didnt show up because he was pissed at the way meek came at him. Meek was upset because drake was supposed to be the big celeb for his event. The track was already recorded and done when meek found out. Meek decided to still put the track on his cd. Months later meeks album comes out and drake doesnt tweet about it. Meek was upset because he felt like despite them having anargument, drake would still support since hes on the album. Meek started feeling himself when he saw how taylor went at nicki and how much love nicki was getting even though taylor is the bigger star. Meek felt like ill just expose drake and the public will side with me because they will see that drake is a fraud just like they sided with nicki over taylor. Word gets around to all the djs like charlemagne and flex that drama has a ref track and more ref tracks. Flex begs drama for the 10 bands track and drops it. By jow most djs already know that there are more ref tracks that drama has. None of them care because they dont want to ruin their relationship that drake has with their station. Flex decides to put it out there when he found out about the other ref tracks acting like he had it but drama wouldnt give it up. Meek didnt think drake would respond to him and was shocked when charged up came out. Meek did his diss record and told flex he would give it to him but was still trying to get the other ref tracks from drama to give to flex but drama wouldnt give it so flex and meek last minute decided not to premiere the diss track because they wanted to drop everything at the same time and ether drake. The next day drake releases his second track and shocks flex and meek because they werent expecting it. Meek already hAs his diss wanna know recorded but pretends like he still has to record it because he wAs still trying to get the ref tracks. Dj drama gives the track to meek who then tells flex that they are ready. Dj drama did not get paid for it. He wAs upset like op stated because he gave meek the ref tracks as a favor and meek went and called TI name in his track about the pee accident. TI got upset at drama and drama is pissed like op stated because he involved TI. Everything has backfired on all of them. Meek already knew about the p!ss incident but drama didnt think he would say it in his song and put TI name. Another tea. The beggining of wanna know when meek talks about a !!!!! who went to jail for not snitching but later snitches. He was talking about AR-AB. When drake ref his name in back to back. Meek found out that AR-AB will be signing to ovo and has told his secrets to drake....meek is scared because drake has alot of info about him. 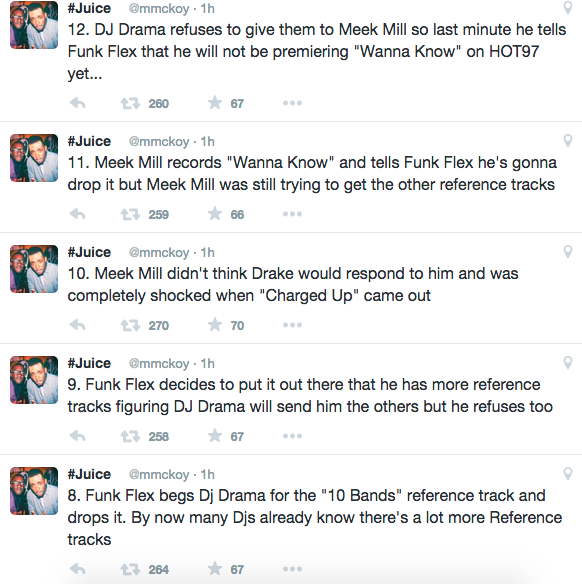 This is the reason y drama gave the ref tracks to meek. They knew drake has ammo on meek and could air it out so as a friend drama gave the tracks thinking it would stop drake and it all backfired. It is true what op stated that drama was supposed to do drakes mixtape but drake backed out last minute. Alot of guys in the industry feel like drake is too c*cky and is feeling himself too much. Drama was upset because drake cost him money. Same thing he did to jayz. Drake is at the top and they hate his attitude and feel like he is an as*hole but kiss his a.ss secretly because he can get them hits. This beef has nothing to do with nicki. Nicki and drake were still cool after meek found out about rico ref. nicki was even at coachella in april and drake brought her out. She decided to stay out of it and wAs shocked when meek aired it out. They got into an argument about it and thats y meek apologized to nicki on stage the next day. Nicki is stuck because she loves meek and has to support him because he is her man but she doesnt hate drake. She is loyal to meek but has told meek she will not say anything about it or back him up but will still stand by him.Meek did not ask quinton to write tracks for him. Quinton and meek have never even met. Drama wAs not paid for the ref tracks. He gave them to meek for free after refusing because meek found out that AR-AB and drake have been talking and are working together after drake mentioned him in back to back. They felt like drake is getting ammo to destroy meek so wanted to finish him first. They thought the public would disown drake and side with meek. There is alot of dirt that drake now has from AR-AB about meek. Lets se what he will do with it. Drama and meek are close. Drama gave the 10 bands track to flex and flex thought it would finish drake but the public turned on flex and said how do we know its real? Thats when flex said he had ref tracks for the other songs because he was getting so much hate. Flex didnt have the other tracks. None of the other djs did either. They all just knew it existed but flex was the only one begging for it. Drama wouldnt give it to flex. When drake released charged up meek was surprised because he didnt think drake would do a diss track since he never responds. He then records wanna know and tells flex he will give it to him on monday but then during the show meeks tells flex they should wait till they can see if they can presuade drama for the orher tracks. The next night at toronto meek doesnt diss drake because him and flex are still working on getting the tracks and airing it out all together. So yes drama wasnt going to give it up but once they saw how dirty drake was playing by getting into contact with AR-AB, drama was like well if hes trying to destroy you then lets finish him. Drama felt like drake is a snake by trying to sign AR-AB. Thats a big no no...once they found out they knew drake is planning on destroying meek so drama felt like he had to help his friend meek out but didnt know merk mentioned TI. 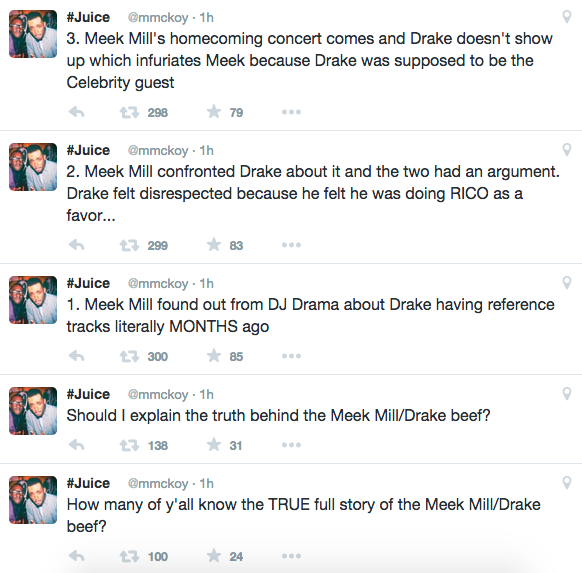 Drama now feels betrayed by meek. Alot of people in the industry look at drake as soft so no one expected him to go all the way. 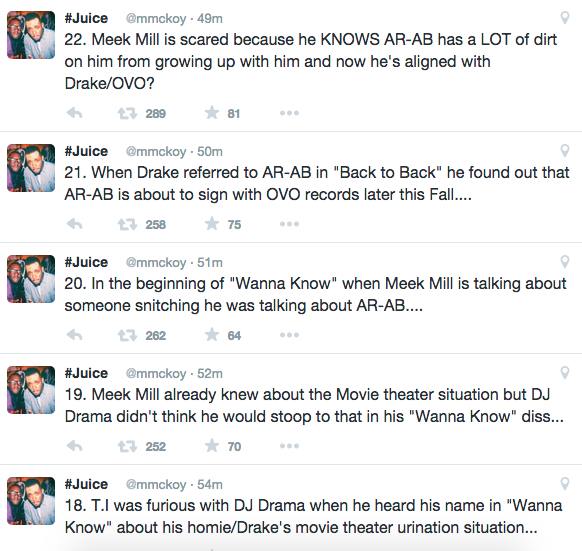 Drake has alot of ammo on meek and could finish meek. Meek found out from some of his homies in philly. Drake is going for blood. Meek blackballed ARAB from getting signed by anybody when tney fell out. Here comes drake saying ill sign you and work with you and give u exposure and AR-AB is happy and starts spilling info. ThAts y drake shouted out AR-AB to let meek know im coming for you. Meek and drama are done. Drama now hates meek and told flex to pull the tracks from his website after he posted it but e ery ody downloaded it and then the next day flex goes back and puts the download links back on his website. Drama feels betrayed. You will never hear flex talk about those ref tracks again on air. He knows he screwed up. Drama now feels betrayed by meek. Alot of people in the industry look at drake as soft so no one expected him to go all the way. Drake has alot of ammo on meek and could finish meek. Meek found out from some of his homies in philly. Drake is going for blood. Meek blackballed ARAB from getting signed by anybody when tney fell out. Here comes drake saying ill sign you and work with you and give u exposure and AR-AB is happy and starts spilling info. ThAts y drake shouted out AR-AB to let meek know im coming for you. Meek and drama are done. Drama now hates meek and told flex to pull the tracks from his website after he posted it but e ery ody downloaded it and then the next day flex goes back and puts the download links back on his website. Drama feels betrayed. You will never hear flex talk about those ref tracks again on air. He knows he screwed up. Trust me its not just a warning. AR-AB is the biggest goon in philly and has support. Drake isnt hooking AR-Ab up justto warn meek. He wants to destroy him. Drama and meek knew that and felt like they had to finish drake. Y do u think drake was begging meek to respond? meek and flex were so sure thAt the ref tracks would finish drake and it backfired. Meek is done if drake continues. Trust me when i say theres alot of info drake has on meek from his older days in philly. 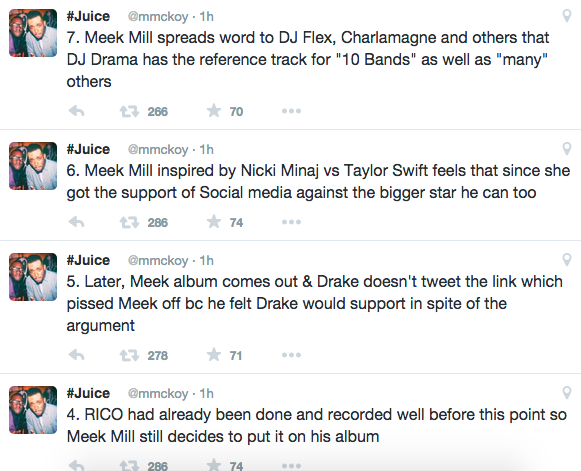 Thats y meek is acting defeated. Their only hope now is that drake feels pity and lets everything go but i have a feeling he wont so they are waiting to see what he will do next. Meek and drake are not working things out. Their relationship is done. Like i said drake is not helping AR-AB and promising to get him out of the hood and help with his music after being blackballed just To shouthim out in a song. Thats y meek mentioned the 50 cent and jarule line and said he wont stop till he gets a check.. Meek knew that it was one or the other. He thought he would destroy drake so that if drake drops another record, people would be like your a fraud who doesnt write but instead he has gotten clowned and drake has public support. Meek has nothing on drake. His strategy was ref records and its backfired. He thought he was 50 cent and now hes jarule lol. Drake is going for blood and has the biggest goon in philly AR-AB behind him. Alot of people in philly love AR-AB and hate meek for blackballing him. Alot of the industry hates drake and he knows it now im sure. Meek tried to finish his rep so drake has to finish him. Meek knew drake was planning on doing more so he thought he would finish drake first. Everybody is quiet waiting to see what drake will do next then plan their next move. Meek now knows that drake can finish him thats y everyone is quiet and he posted thAt message. Hes defeated. That was a last attempt to get the public to see that drake is a fraud. Its not worked. Meek and drama friendship is most likely done. Drama will be fine. Most people behind the scenes dislike drake although they wont admit it. If drake doesnt put out anotner record and finish meek then meek will be fine. He has alot of support behind the scenes. Thats y he was so c*cky. Drama and everybody is shocked because they knew the public would disown drake and turn into jarule. They failed to realise drake fans dont care. Nobody can believe that nobody cares drake used ref tracks. Drake has changed the game. People now are looking at him like wow. Meek has to hope drake decides to stop but meek heard from people in philly that know AR-AB that drAke wants to finish him. This isnt just oh u didnt tweet my album. Drake never contacted drama about the ref tracks so drama felt likehe has no loyalty to drake. Hes friends with meek and did him a favor. its a no no in the hood. Thats y meek posted that in the hood u can snitch but people still respect u. Meek was shocked that after people in philly knew AR-Ab was going with drake alot of people still support him. Truth is AR-AB has no choice. Meek blackballed him. Drake is willing to help him out even if its for tne wrong reasons. Same reason he sent char bottles. Drake is not just doing this for fun. He wants to end meeks career and he wont stop. Alot of philly !!!! !s hate meek and AR-AB is a top goon. Go listen to back to back and u will see where drake said "check em for a wire or a ear piece" that was a sub to meek that watch your back. U dont know who is talking. Most people didnt puck up on it. Last post then im going to bed. I like drake but feel bad for meek a lil because he didnt know this is how it would turn out. Meek just knew drake wouldnt respond and may just diss him on a track sub on his album. Got so c*cky. Released 10 bands with flex and when tne public didnt care...him and flex thought oh its because its only one track...if we get the others. No way will the public not believe drake is a fraud. Hes done. Flex becomes the hero and so does meek. Then here comes drake with charged up...they laughed at him...they knew the track was soft. Meek then goes and records wanna know and tells flex they should drop it. someone in meeks camp tells him its better to wait a lil bit. Dont drop it just yet. Flex knew during the show but didnt say anything that night. Thats y he wasnt mad at meek the next day and meek said lol on twitter when people were upset. Meeks camp told him wait till after the toronto show to drop wanna know because they might boo u hard. Meek didnt know that early that morning drake would release back to back. They now had to come up with a diff plan after hearing the subs in the track...drama decided to give the tracks but meek and flex figured they should just wait till the day after drake dropped back to back when the jokes on him and flex have died down. Thats y meek lied that he was waiting to go in the studio. His track was already recorded. They just knew the public would disown drake. Thats y flex dissed charl again that night and was like i run ny And kept dropping bombs And then put the ref tracks on his website and played meeks track hundred times that night. Everything backfired. Meek got clowned for his track and nobody cared for the rev. Sad thing is that people hyped up meek and made him feel like his track was ether..he just knew drake was done lmao. now drake will finish him unless he feels pity.